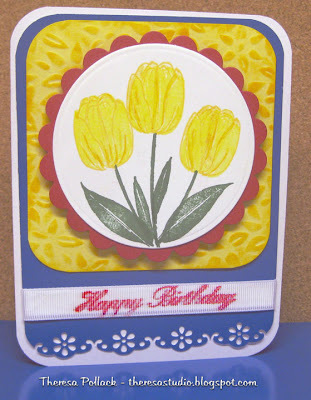 I made this card using Spellbinders Impressabilities Flowers with the letterpress effect technique as shown on STV by Gina K. Click here to see her video. Made the tone on tone background and matted it on deeper blue and on white base card. Stamped image and cut with oval nestie and matted on scallop oval. Added ribbon and pearls. Annabelle Challenge "Say It With Pearls"
Challenge: Just use your Sassy Cheryl image as the main part of your card, color any image any colors you wish, use any sketch layout you'd like, but leave all of the rest white... So it's a "white-on-white" theme and that means you can't use colored designer papers, ribbons, embellishments, etc. Only white this time! 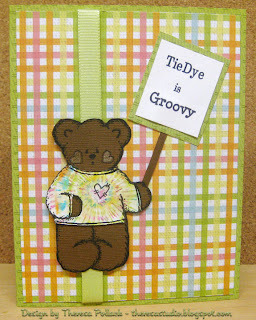 For my card I used this fun Sassy Cheryl image "Hanging Out to Dry" and used all white to layer behind the image using CB EF's to emboss the layers. Used MS punch "Lattice" for a border to which I added some grosgrain ribbon. Added sentiment on a circle that I tied to the lattice. For some added dimension, I used dental floss for the clothesline (hope you can see) that I threaded through the paper and some pearl buttons to anchor the line. Tied on a circle with sentiment. 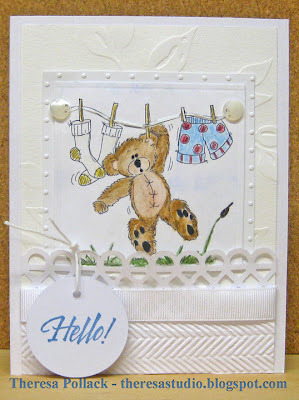 Digital: Sassy Cheryl "Hanging Out To Dry"
Tomorrow is our laundry day...maybe I should wash some of my teddy bears? Thanks for dropping by...please leave a note for me. 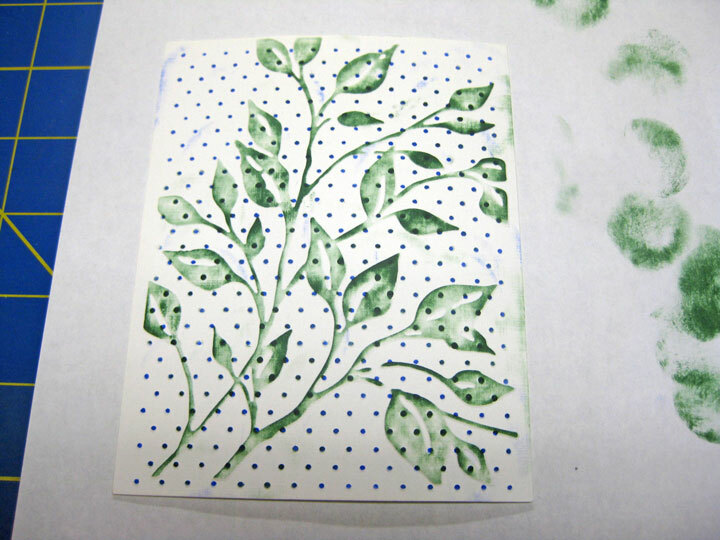 Congratulations to Laura on the first year of Creative Clear Stamps! I decided this week to use this challenge sketch to make a Birthday Card for CCS in celebration of their week long Big Birthday Bash. Check here to find out about all the excitement going on at A Fairy Creative Place and their store. This week is going to be LOADED with giveaways, specials, and FUN! 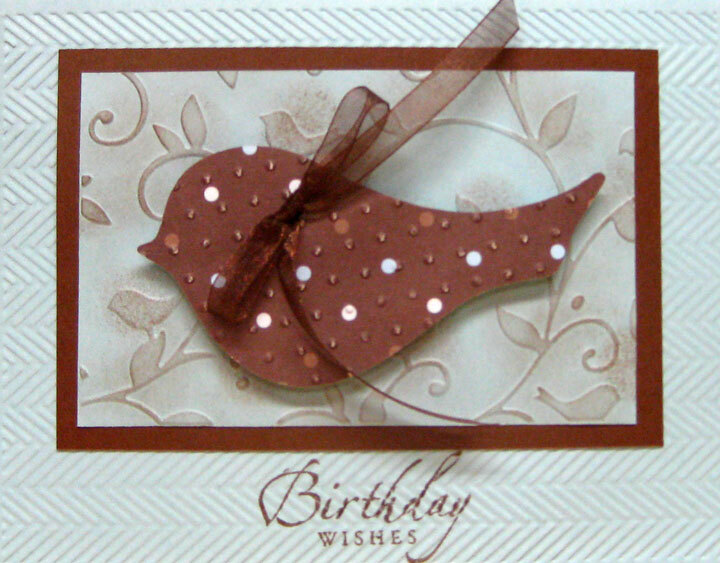 Back to my card: I took some poetic license and copied the banner for my card from their blog and layered this over CS embossed with CB "Happy Birthday" EF. Used a white card base and matted with yellow. Printed a circle with a sentiment on the puter and cut with a nesties. Now, this is where I had some fun. 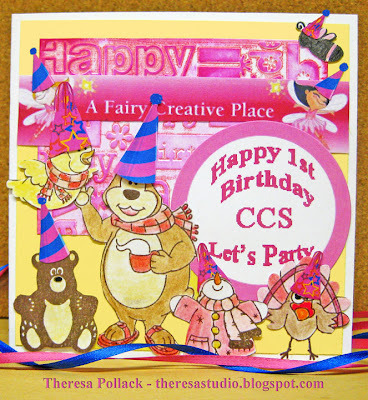 I stamped the CCS characters that I had, colored them in party colors, cut them out and gave them all party hats. Added them to the card using Hunny as one of the sketch elements. Now they all join in with the celebration. Sue brings us this weeks challenge from There's Magic In The Air. She wants us to use the image called "Easter Lilies" by Paper Cupcakes that is free this week here and to make a card to showcase this beautiful image how ever you like! Thanks for this lovely challenge and the image. 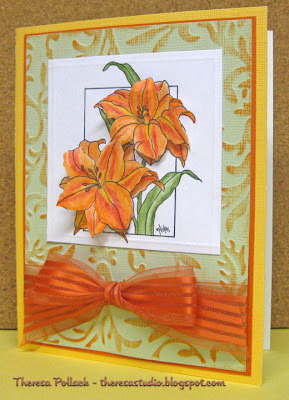 My inspiration for this card came from day lilies that I have in my garden. 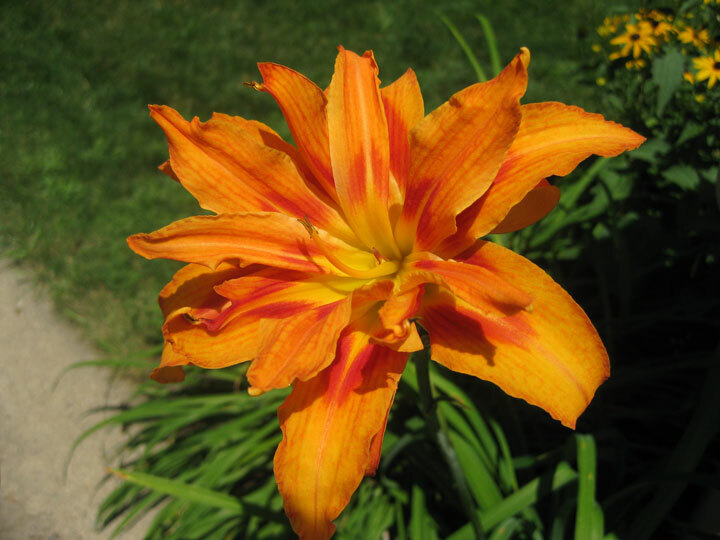 They are lilies with multiple layers of petals. Shown is a picture from last year that I used for my coloring guideline. I printed the image twice and colored both (flowers only on one copy) with pencils and OMS. I trimmed the image to 3"x3" and cut the flowers from the second image and placed indirectly over the first image using pop up dots to create dimension and to appear as lilies with multiple petals. Since I could not find a DP that I liked, I created my own by embossing green CS with CB Victoria EF and then highlighted the raised area with orange ink using a pod. 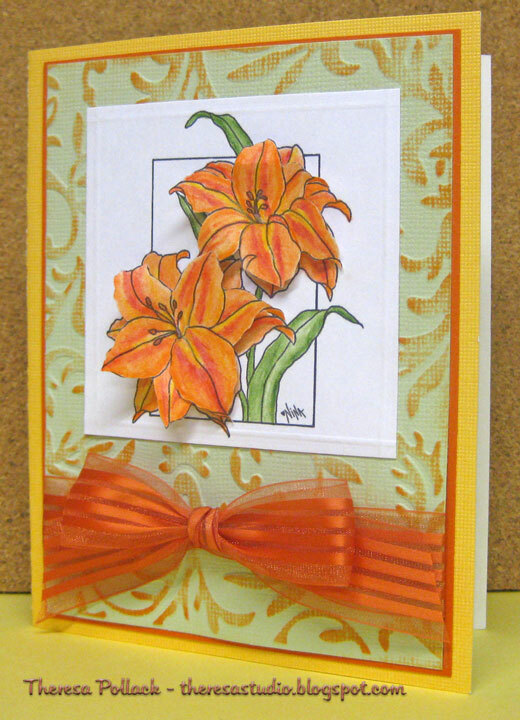 I matted this with an orange CS with a narrow edge showing and attached to the card base of yellow. Attached image to card. Finished with ribbon and a bow tied with Bow Easy. 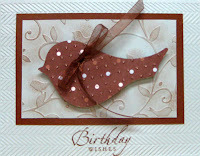 I decided not to use a sentiment on the front so that the card is versatile for any occasion. I really like the end results. Image: Paper Cupcakes- "Easter Lilies"
Thanks for looking at my lilies. Hope you like the card. 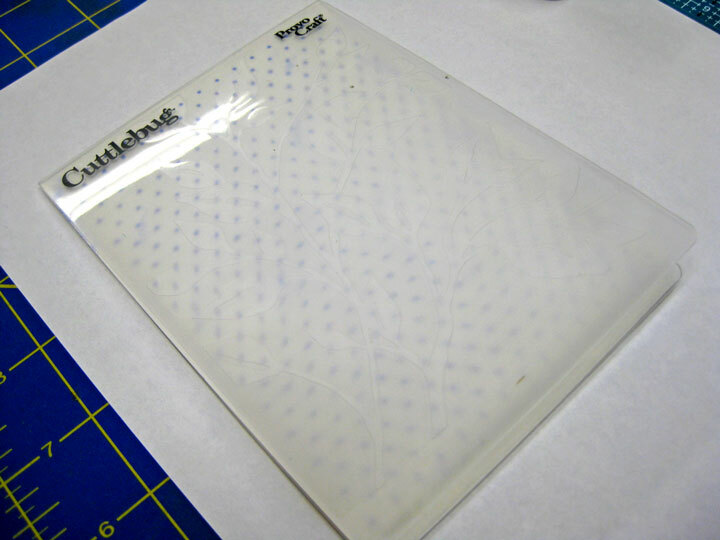 Saturday at the Stamping Convention, I broke down and bought one of the Spellbinders Impressabilities: Seascapes. Of course I had to try this out so I made a card for Gina K's Inspire Challenge - to look at Batik photos and create a card that is inspired by what you see and maybe try the stenciling technique. My card does not really have the bright colors of Batik but has that look. I stenciled with rich cocoa and then added some pumpkin spice for more color variation. Matted this on Pumpkin Spice and white card base. 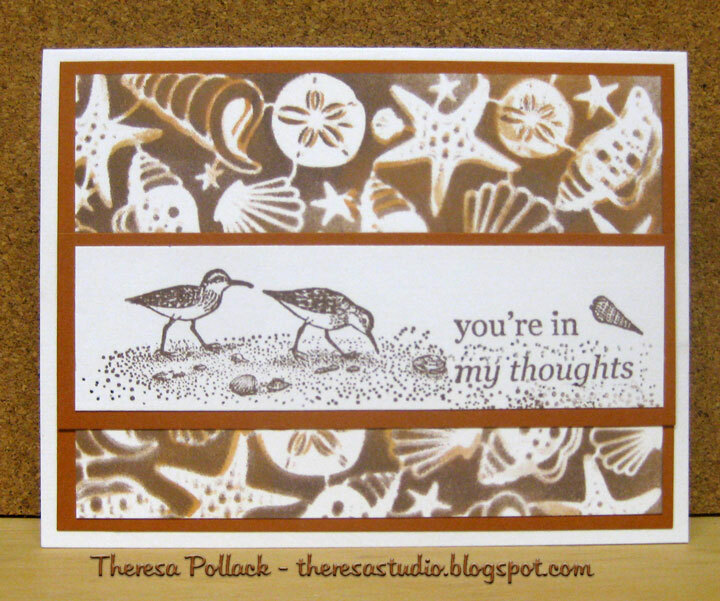 Added image of birds on the beach and sentiment. Last week Gina K had a release party and had some challenges. Theresa did a sketch challenge for the party release shown below. I made this card following her sketch. 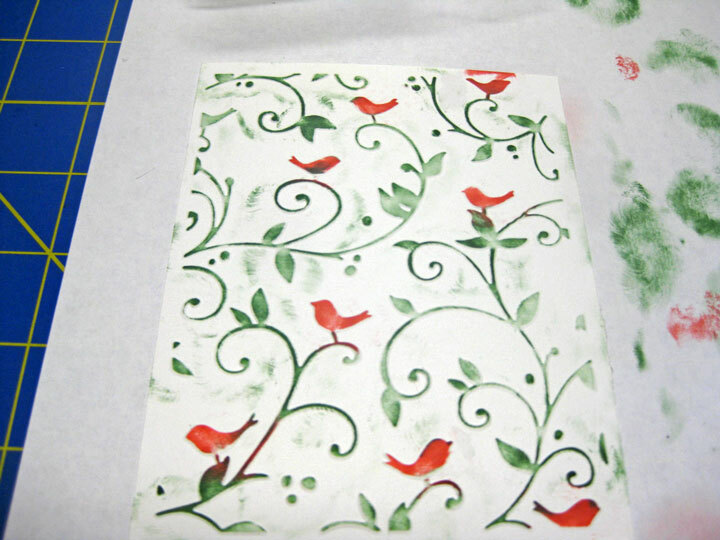 On Saturday, Pat, Rita, and I had another "Adventure in Stamping". 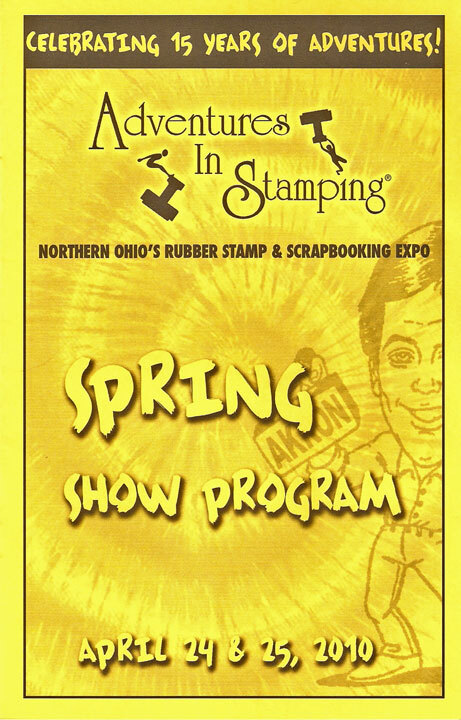 We attended the Stamping Convention in Akron where 50 exhibitors from all over the country and one from Canada selling all kinds of products. There was all sorts of free booth demos, make and takes, and door prizes and so many people crowding the aisles and booths. We arrived just as the doors opened at 9am and the crowd was already there. I have never seen so many Punches, Spellbinders, Cuttlebug items, Copic Markers, and Stamps in one location!!! 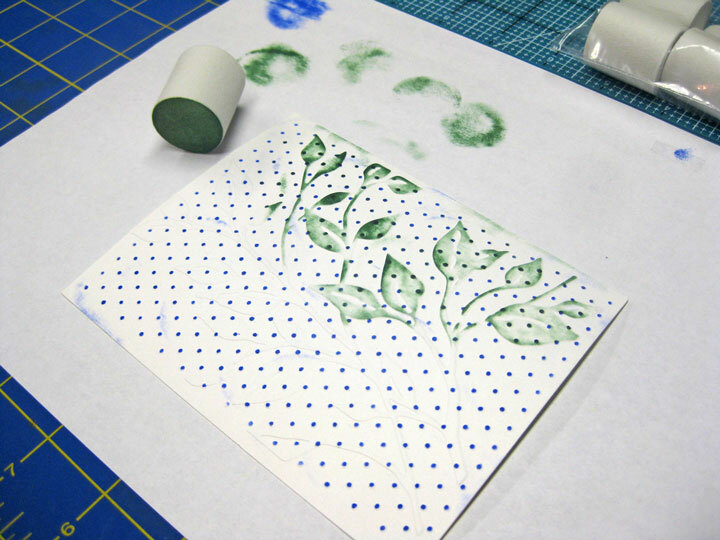 Any thing that you ever wanted for stamping was there. So many card examples in every booth that sold stamps. We walked the aisles for 4 hours making sure we saw everything and made our purchases. It was hard to see the demos because it was so crowded....so many more people than I remembered from previous years that I attended. I did break down and bought one copic marker.....I would have bought more but want to make a list of colors so I know what to buy when I get serious about purchasing copics. And I want to shop around for the best price to make my money stretch farther. I have found a local store that now carries a limited number of colors. My fave purchase was a Spellbinders Impressabilities which I did not have. Stay tuned for a card that I will be posting made with that. Made this card for Isabella's Challenge using her "Basket of Apples" digi. All you had to do to participate was use a food image from Isabella's Sketchbook. Colored the image with a combination of markers and pens. Cut image with a square nesties and matted on yellow circle.Base card of white matted with blue check PP and blue CS embossed with Fiskars texture plate of Squares. Finished with red raffia, button, and sentiment with sentiment. Used Card Patterns Sketch 60 for layout but missed posting in time for that challenge. Hope this card may make someone "Feel Better". Tina at Stamp TV challenged us to use the colors OCEAN MIST (or a light blue) and TAN! 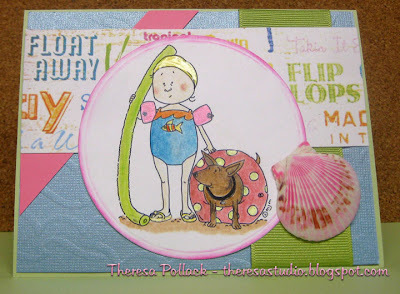 These colors bring the beach to mind so I made a card of the beach wishing I were there. I used an old stamp I have had a long time. Stamped this twice, once on tan CS and again on Blue CS....trimmed the tan one and mounted over the blue copy. Used bleach to whiten the clouds and highlight the waves. Also colored in other parts with pencils and pens. Cut out image with nesties and matted with tan. 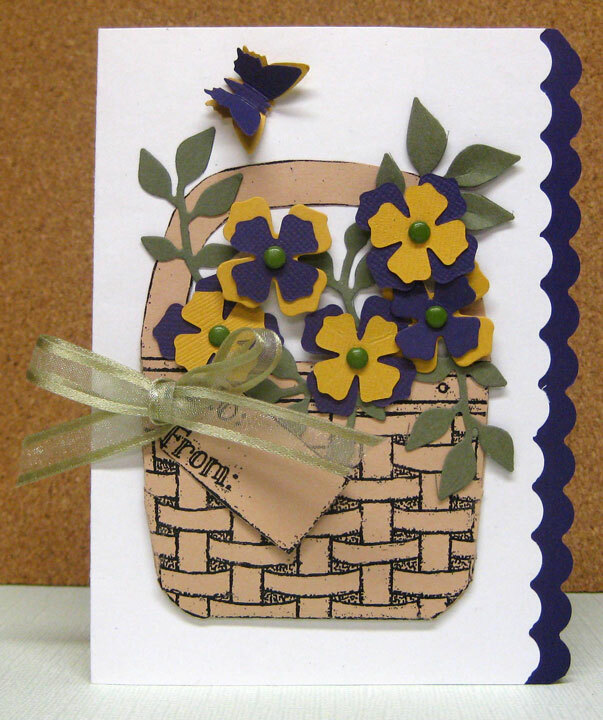 Used light tan mat embossed with CB Herringbone EF and blue mat embossed with Fiskars Waves texture plate on a base card of tan CS. Made this quick card with a great sketch from A Fairy Creative Place. Having a great sketch makes for an easy project. Sketch is shown on lower right. 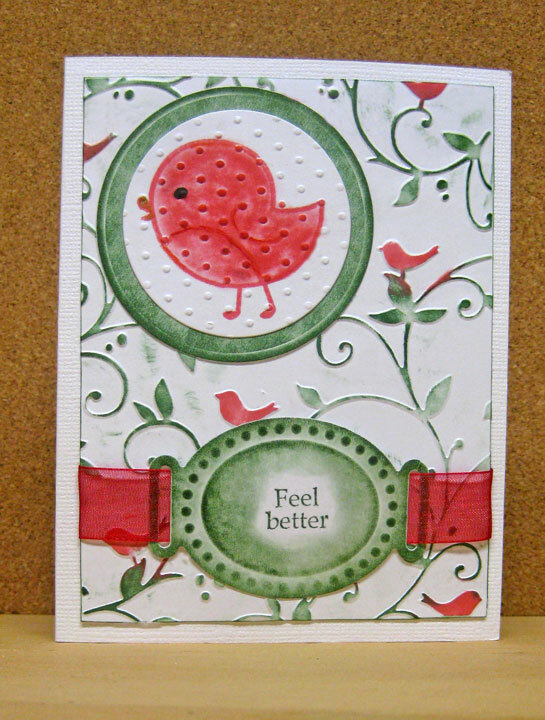 Using a light card base I layered the mats of patterned paper and made the sentiment the focus of the card on nesties cut circles. Thought this would be a good card for Operation Write Home. 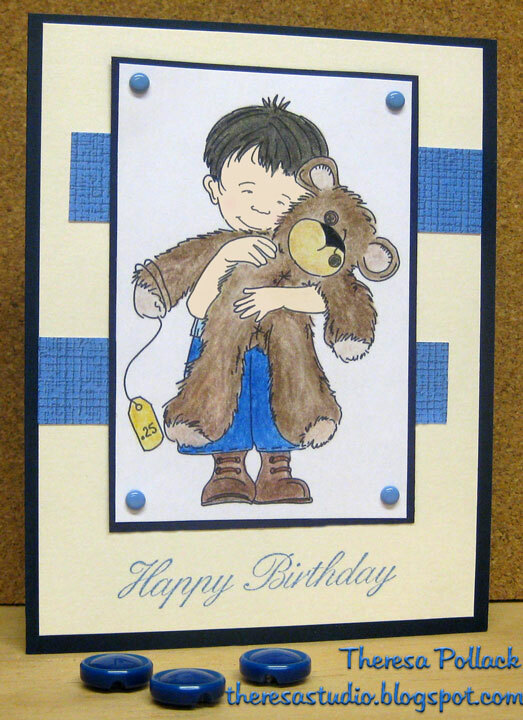 Check out Operation Write Home here if you have some homemade cards to send our troops. 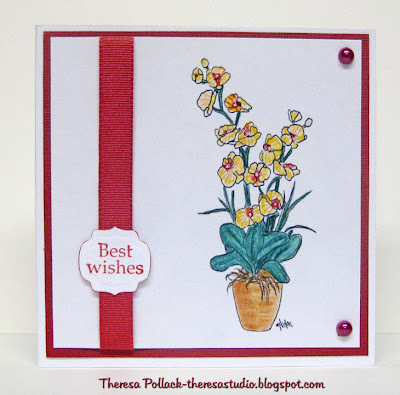 Inspiration for this card for TMITA and Digital Tuesday is the orchid pictured below that I have blooming in my living room. At There's Magic in the Air, Kim 's challenge was to use any "acquired image" from Paper Cupcakes and to use the following recipe: any Paper Cupcake image, a 4x4 size card base , 1 ribbon , 1 single type of embellishment in ANY quantity, 1 stamped/printed sentiment and NO patterned papers. 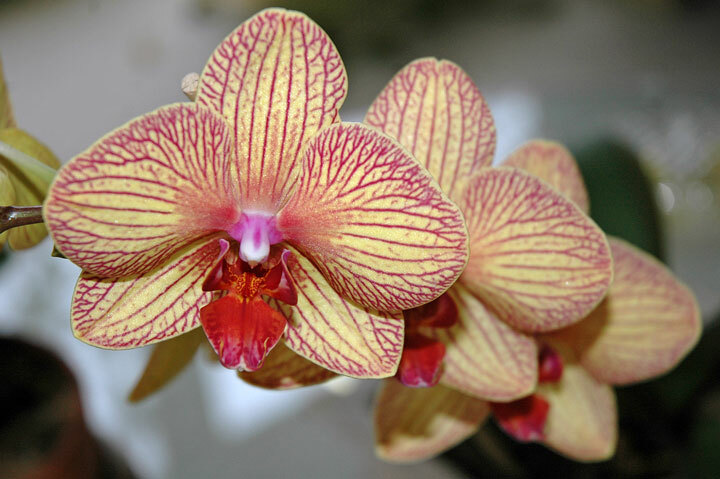 I had this image of an Orchid purchased here at Paper Cupcakes that I colored with pencils and OMS. 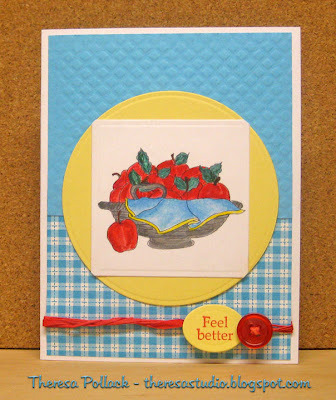 Added ribbon and some red pearls and matted the image on red CS and then onto base card of white of 4x4 size. 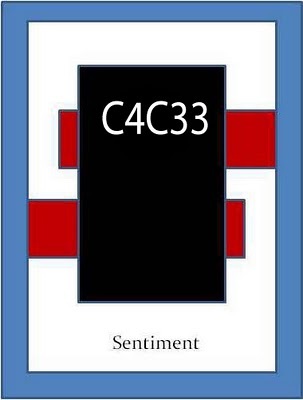 Added sentiment cut with Label 9 Nesties. 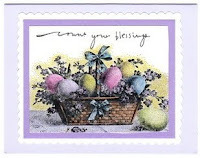 This card also qualifies for Digital Tuesday challenge which is April Flowers or April Shower. Make anything as long it relates to April flowers or April showers and use a digi somewhere on your creation. I have had this orchid for a number of years and love how it blooms for so many weeks. First blooms began in January and is now full of blooms. Thanks for stopping by today. Have a great day. When I think of Mother's Day, I think of roses, pink, and lace. When I was looking at Vicki's sketch challenge at Stamp TV, I thought this would be a great Mother's day card if I used those elements. Feature rose for the center was matted on scallop circle. Cut out long stem rose that I stamped and colored with pencils and OMS and popped up the head of rose on layered circles with dimensional. Printed sentiment on computer and cut and matted using nesties. Used lace as border and attached to embossed mat of pink CS. 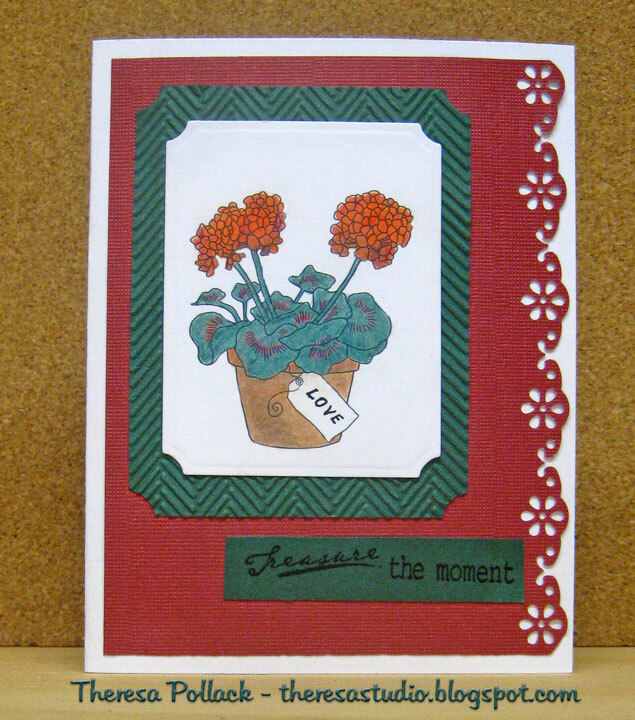 Stamps: GKD -"A Year of Flowers" and"Pressed Flowers"
Love those digital images at Sassy Cheryl's. 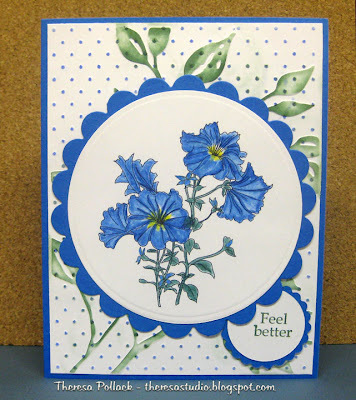 This week I bought the image on my card and used it in Jackie's challenge on their challenge blog to use a Sassy Cheryl boy image with the color combo of blue and cream. Once I colored the image with pencils and OMS, I realized I did not have any DP with blues and cream so I struggled a bit. I decided to use the sketch from Crazy 4 Challenges to design the card. See Sketch below right. Used navy CS for base card with a cream mat. Added strips of blue DP. Matted image on more navy CS and added blue brads. 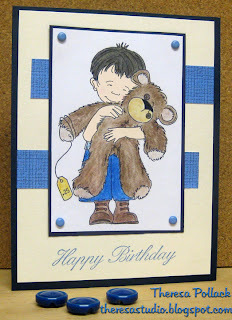 Image: Sassy Cheryl-"Love Healing Boy Stamp"
Have you hugged a bear today? I have. 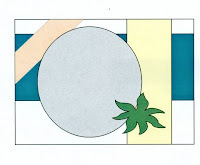 Challenge 3 at Isabella's Sketchbook is the simple sketch shown below. 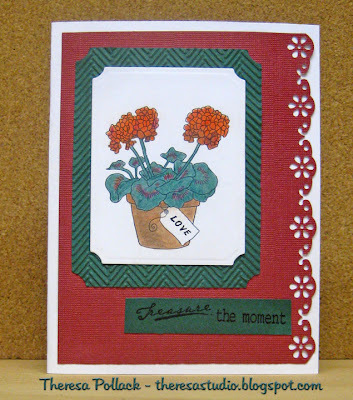 I chose to use this lovely image of geraniums purchased here as the focus on my card. 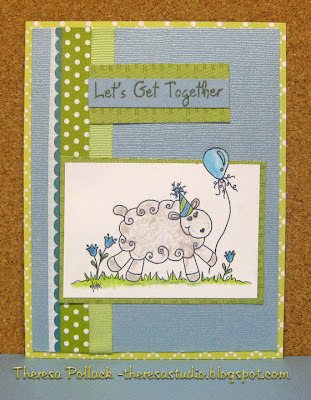 Colored the image with pencils and OMS which is cut with Nesties large label die and matted with a green mat. Embossed this with CB Herringbone EF. Placed on red mat edged with MS foral lace punch. 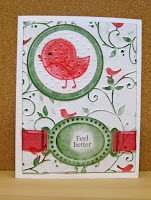 Finished with sentiment stamp from Hero Arts. All CS is from Stash. Thanks for dropping in for a visit. Don't we all buy paper* that we like and think..."Why do I really need this?" 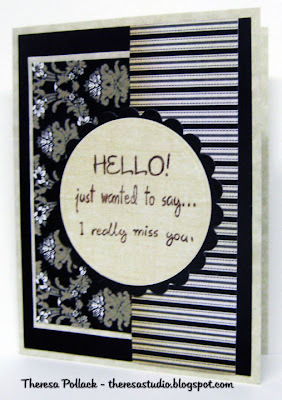 I did that just the other day but found a use for it when making a card for Mo's Digital Challenge this week. Peggy put together a fun sketch for us to follow. You can flip it, rotate it... whatever!! 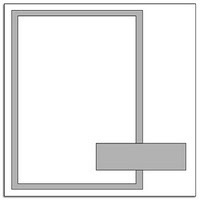 Just as long as the main elements obviously are similar to this sketch. I chose to use Mo's image Pool Party which by the way was a freebie on PCP for her group. 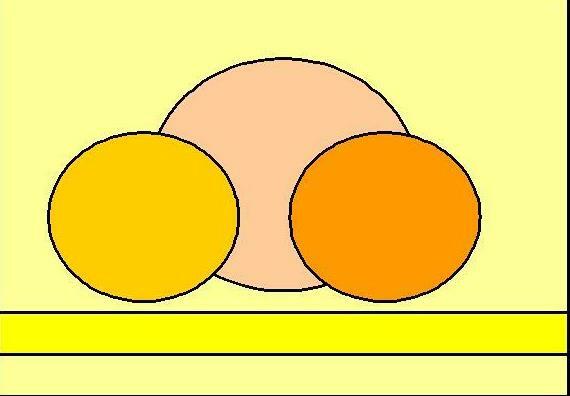 I colored the image with pencils and OMS and Jelli-Ink Pens and added stickles to her cap, arm floats, and flip flops. Color inspiration came from the new paper that I bought for no reason. Colored the edge of circle with ink after I cut her out. 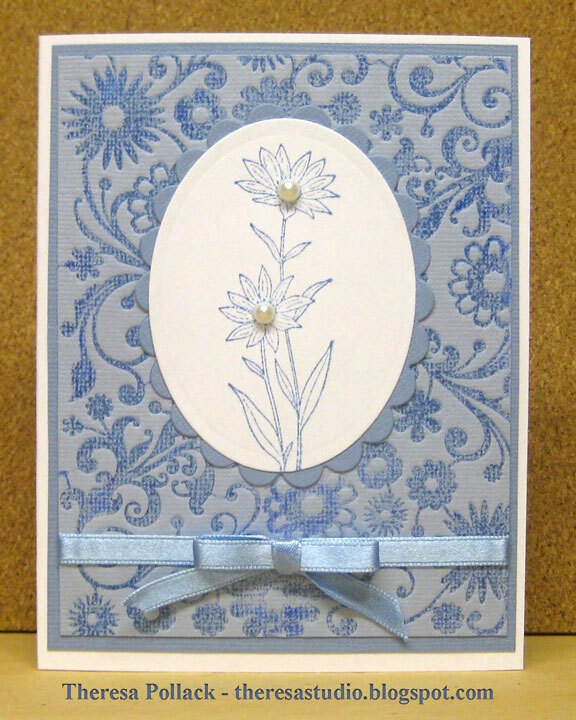 Used green CS for base card layered with blue CS embossed with Fiskars ocean waves texture plate. 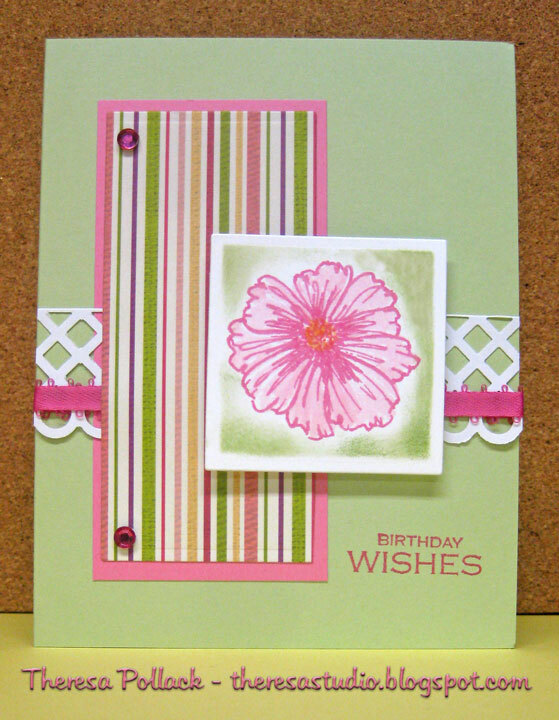 Layered this with ribbon, strip cut from that patterned paper that I bought, and a strip of Pink CS. Attached image and added a shell that I inked with pink. 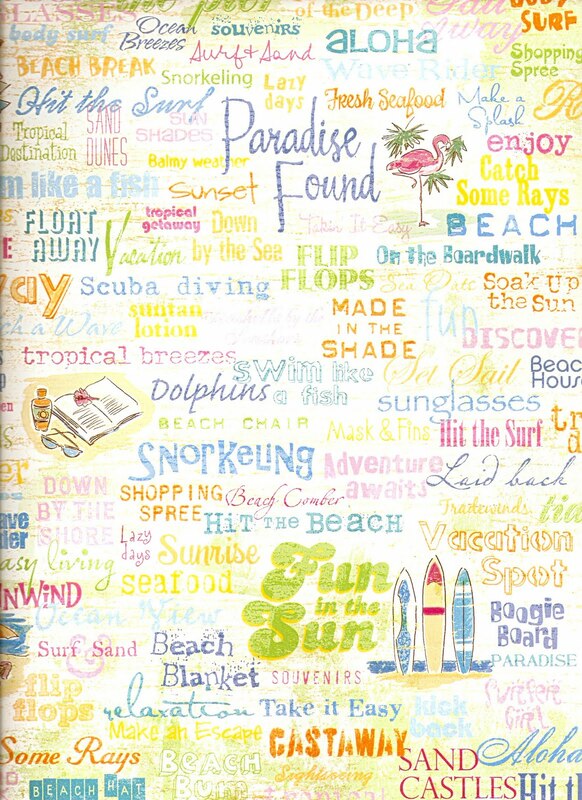 Thought this would make a great card for someone headed for a beach vacation to wish them a fun time. Another cloudy day here. Be glad when we can wear our swimsuit and sit by the pool. This week's color challenge from Tina is ... ROYAL BLUE, RED, AND YELLOW... and any neutral color you need to add. I made this card witth tulips in yellow and green stamped on white CS matted on a red scallop circle with a mat of yellow CS embossed with a Fiskars texture plate and sponged with Summer Sun. Used another mat of blue with edges punched with a MS Punch and corner punch. Base Card was white. 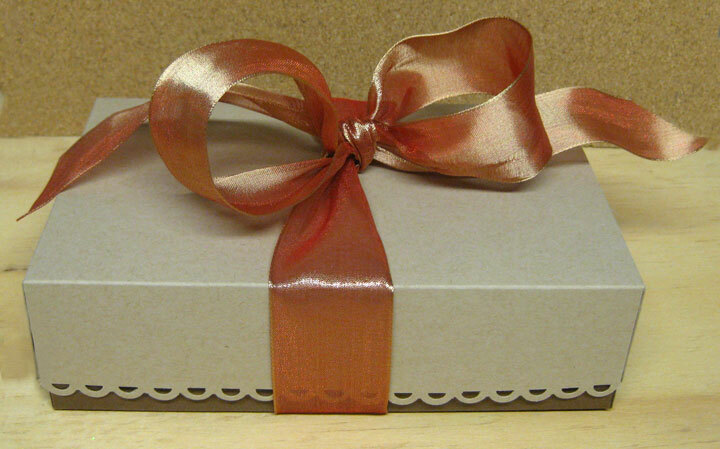 Stamped sentiment on white grosgrain ribbon. GKD Sentiment "Inside and Outside"
I have not done many challenges this week because I have been taking advantage of the beautiful weather to do some garden work. Now that it has turned cool and rainy today I am trying to catch up on some cards. 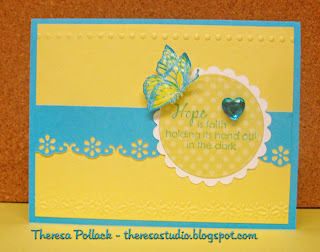 This card was made to cover challenges at There's Magic In the Air and A Fairy Creative Place. 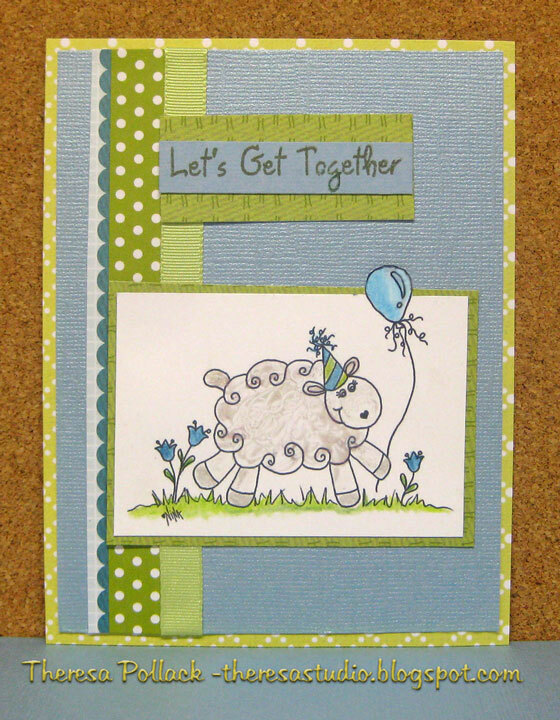 At TMITA, Nilla challenged us to use the image "Merry Wishes" Lamb (free this week) by Paper Cupcakes and to use any shades of blue/green/white. For my card, I colored the image with pencils and OMS and added stickles to the body of the lamb and glaze to the balloon. Liked these greens and blue together. Love the Happy Lamb. 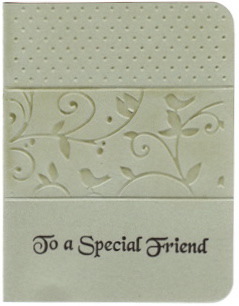 Thought this would be a great card for an invite to get together. Come on over any time! Thanks for stopping by for a look. 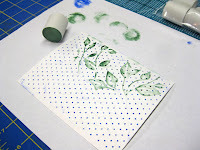 I saw this clever idea of doing a tie dye pattern by inking and misting a stamp on Melanie 's blog here. She is having her own challenge to use tie dye on a project. Since I did not have the doily stamp that she used, I experimented with the Sunflower stamp in Melanie's stamp set "A Year of Flowers" by GKD. Thought it might work because of the circular design. I came up with the look on the bear's shirt on my first try...none of my other attempts looked as good. Since I did not have a Tee Shirt stamp either, I just stamped the bear stamp on my tie dye pattern and fashioned his shirt. Stamped the bear again on brown CS. Had this patterned paper that was perfect with his shirt. 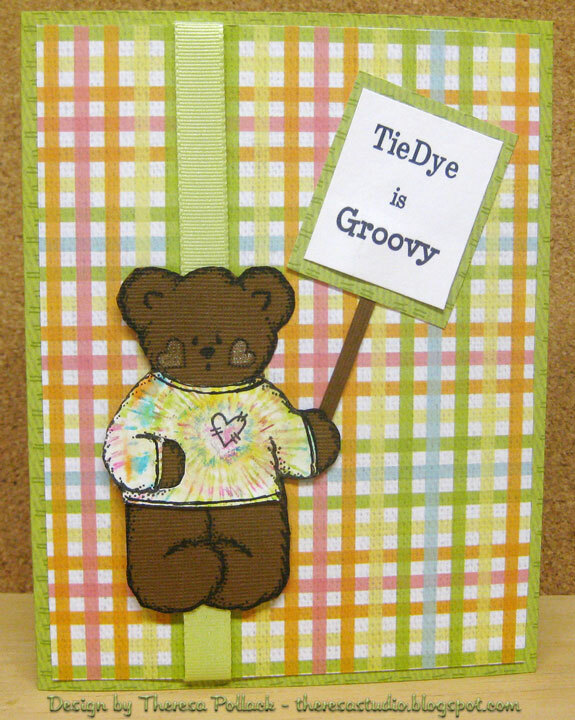 Made his sentiment for sign on computer....now he is promoting Tie Dye! Thanks to Melanie for the idea. 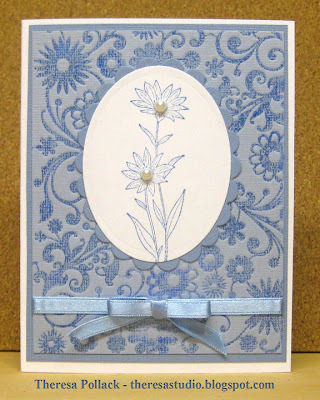 This card was made using a large pod and a small pod to color the raised areas of an embossed surface with 2 different inks by being selective in rubbing the CS. 1. 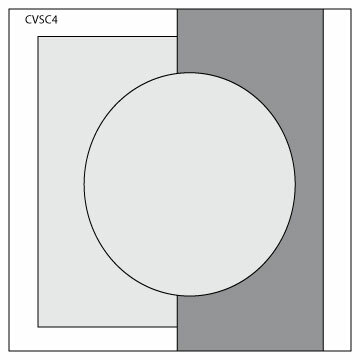 Emboss CS with the EF of your choice. Used CB EF Bird in Hand because this design has 2 distinct areas that can be colored different hues. 3. Using a small pod inked with red, color in the birds of the design. Trim the edge of CS to fit card. Used the pod with green to edge this mat with green. 4. 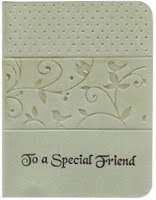 Cut and embossed a ribbon tag with Spellbinders. Stamped sentiment. 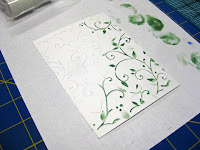 Rubbed this with a green pod to bring out embossing. Bird is on a circle mat of white CS that was rubbed with green pod. Also colored bird with small pod with red ink since I had it handy and the color would match background. Pods cannot be cleaned so it is neccesary to assign pod to a single color just as one might do with daubers or sponges. Since the price is $1 for a pack of 7, the price is right. In one of my recent posts, I mentioned buying some pods at The Stamp Pad. Some of you have asked what is a POD? This picture shows the pods loose on the right side and in a pack ...3 large pods and 4 small pods are sold in a pack for $1. I believe they are made from compressed polyester fibers and are more firm than sponges and daubers. I am also showing sponges in the picture so that you can see a comparison of sizes. 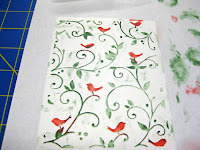 Using these in a circular motion with ink applied, they are great to color the raised portions of an dry embossed design. Can be used with a variety of ink types...just now experimenting with them. Here is a picture of some cardstock cut with a nesties die. On the left side I inked with a sponge before removing the die as we often do to have that clean edge. On the right I used a pod that was inked and used a circular motion to apply color. Since the pod is very flat and firm you can not use with the die on your cutout but the embossed edge does show up distinctly....I like this look. 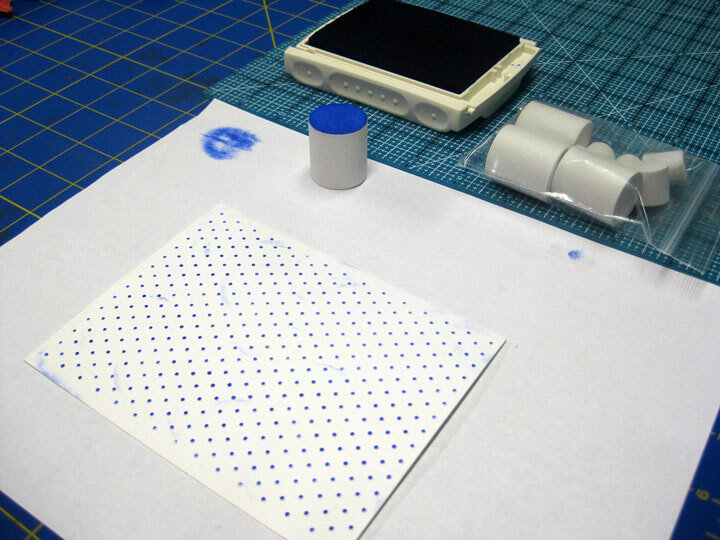 You can start out lightly applying ink with the pod and then add more...important to blot pod after using on the ink pad (just as do when using a sponge) and apply with a consistent circular motion. I have not seen this tool before...only at the The Stamp Pad. Thought I would share this technique with you of Double-Embossing and using a Pod to color the raised areas. 1. 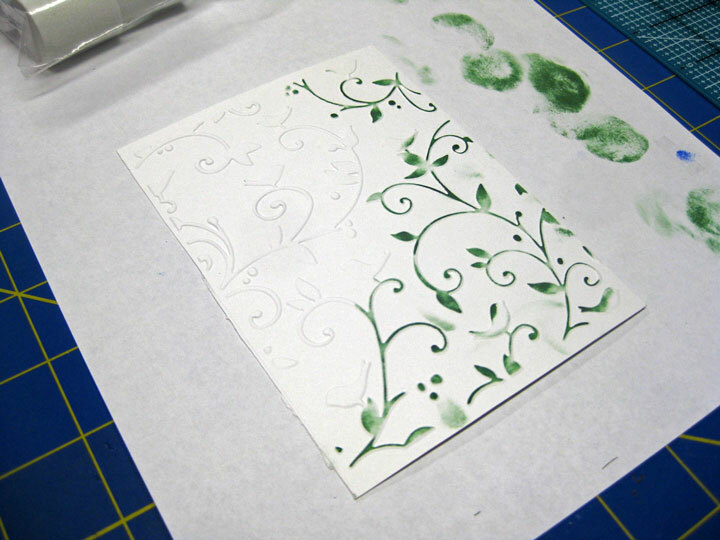 Emboss your cardstock with an EF with whatever machine that you use. I used CB EF Swiss Dots for my 1st embossing. 2. 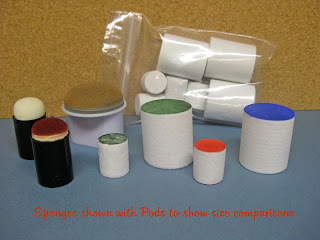 Use Pod and color raised areas. See top picture. I used blue ink. Dab off excess and apply with a circular motion. 3. Emboss the CS again using a different EF using 1 or 2 shims to get higher relief than the first embossing. I used CB EF Leafy Branch for my second run through . 4. 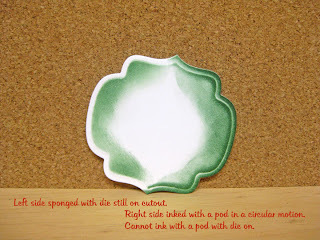 Use Pod and color raised areas a different color for the best effect.I used green ink for the 2nd embossed surface. Remember to work in a circular motion to apply. The finished CS shown in bottom picture ready to use on a project. 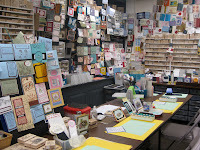 My stamping group "Last Monday Stamping" meets the last Monday of the month---pretty obvious from the name. I missed the meetings in Jan and Feb so I was very happy to be at the last meeting. I am late posting the projects that we made March 29 but still wanted to share with you. Anna Marie, Dianne, and Mary Jo designed and planned the projects for this meeting. The colors and designs chosen were fun to complete. Made two cards and a box from a template. We have had some great projects this year and I am always looking forward to the next meeting. 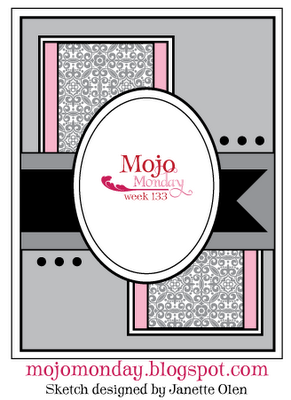 Made this card for 2 challenges--Sassy Cheryl's and Mojo Monday. Do you remember blowing bubbles with gum and having it pop all over your face and in your hair?? For Jackie's first challenge at Sassy Cheryl's, we were to use a Sassy Cheryl's "girl" image and include ribbon in our card or 3-D project. That sounded easy enough. I used the image Bubble Gum Girl which I colored with pencils and OMS. I decided to tie red ribbon for the bows in her hair...it took me forever to tie the bows the right size... tried to use Bow Easy but could not make small enough. I spent more time with those bows than any part of this card and was still not pleased with the outcome. Oh Well! 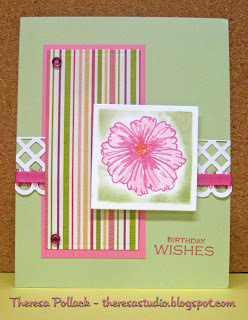 This card turned out so different than I first envisioned....it had a way of its own. First plan was to do with pastels to tie with the wide ribbon with circles but then I ended up with bright blue and red??? Used the sketch from Mojo Monday shown above.....first time to do their challenge. 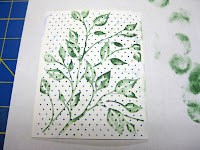 I was lucky enough to win a gift certificate at Isabella's Sketchbook in her first challenge! 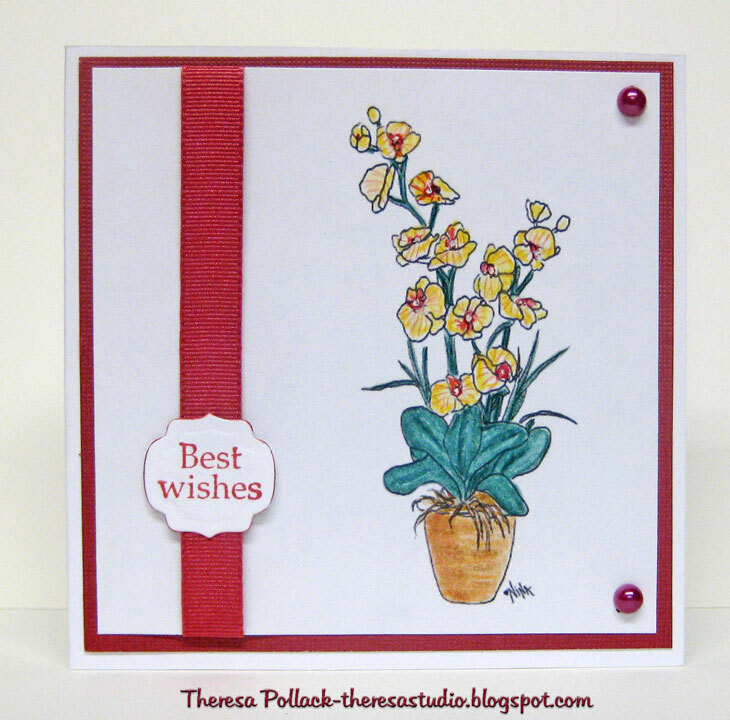 I had so much fun buying at her store and one of the images that I purchased is "Petunias" that I featured in a card for her 2nd challenge. Here are the requirements for that challenge: 1. 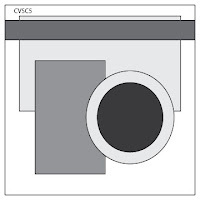 Must use a digi stamp from Isabella's Sketchbook 2. Must be a floral/garden theme 3. 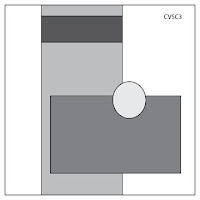 There must be a round element somewhere on the card. I colored the image using pencils and OMS .....not sure blue is a color of petunias but I like the color. Cut the image with circle nesties and matted on a blue scalloped circle. 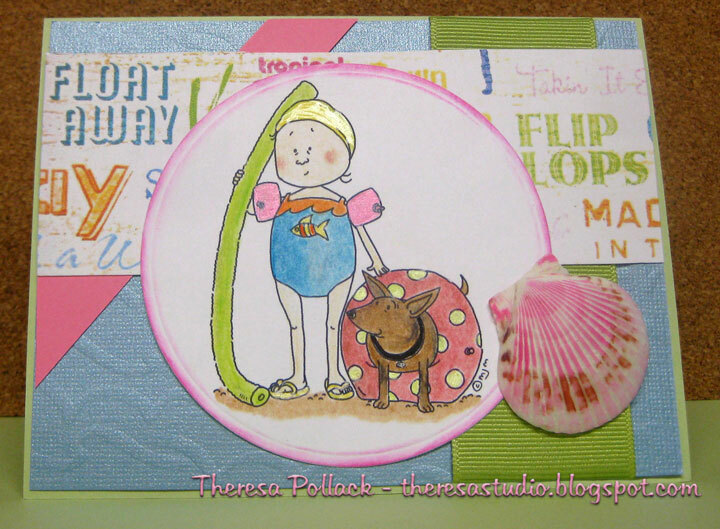 Stamped the sentiment off center on a circle and again matted with blue scallop circle. On the base card of blue I matted with white CS that I embossed with CB Swiss Dots EF and used a pod to color the raised dots blue. I double embossed the mat with another CB EF Leafy Branch using an additional paper shims to give this embossing a higher relief. Used a pod to color these raised areas in green. Double embossing is an interesting technique that I learned at the Stamp Pad, store in Zoar. GKD Sentiment - "Tropical Flowers"
Will be sending this card to my Mother, who fell yesterday and broke her wrist---runs in the family??? What a Store in Zoar!!! 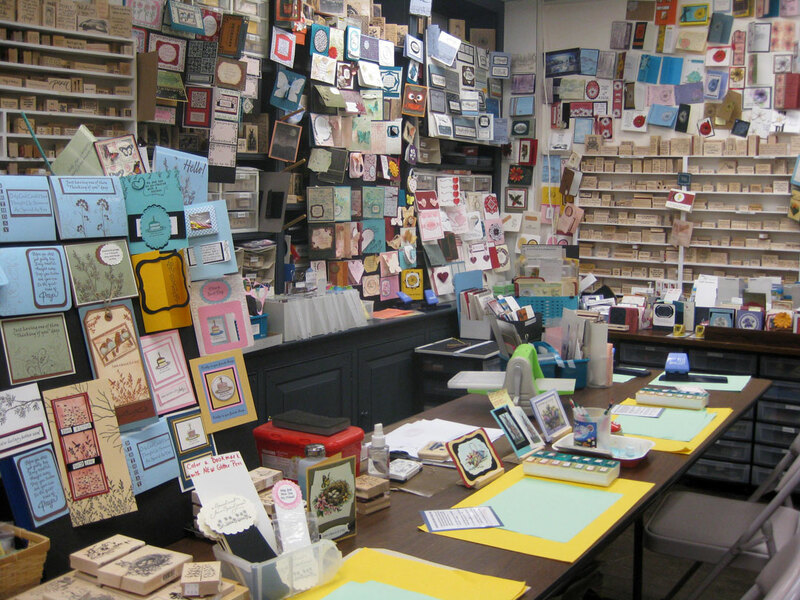 Yesterday, I traveled to Zoar, OH with my friends and stamping buddies, Rita and Pat, to shop an incredible stamping store, Stamp Pad, owned by June Knaack shown to the left, a retired art teacher. The shop is an original log cabin home restored and located in Zoar, an historic village in Ohio. 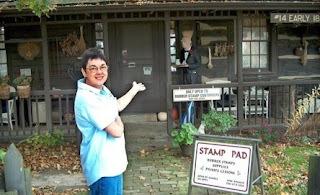 I have been to Zoar many times but Rita and I had never been to the Stamp Pad which Pat has frequented often. We have been planning this trip for awhile. We were like kids in a candy store...this place was beyond my expectations....loaded with everything a stamper would want and more. 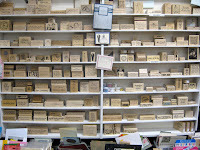 Stamps lined the walls of every room, so many Spellbinders to select, so many card examples to see, so many art supplies....my head was turning to see every nook and cranny. Jane has non-stop demos and "make and takes" all the time. Visit her website to find out more. We did a make and take coloring with Adirondack ink pads using nibs and pods (both exclusive items in the store) on a stamped image on glossy paper. Jane also was demo-ing Cuttlebug "double-embossing" and "debossing and embossing" techniques again using pods to color the raised surfaces.She also demo-ed the new Fiskars border and corner punches. 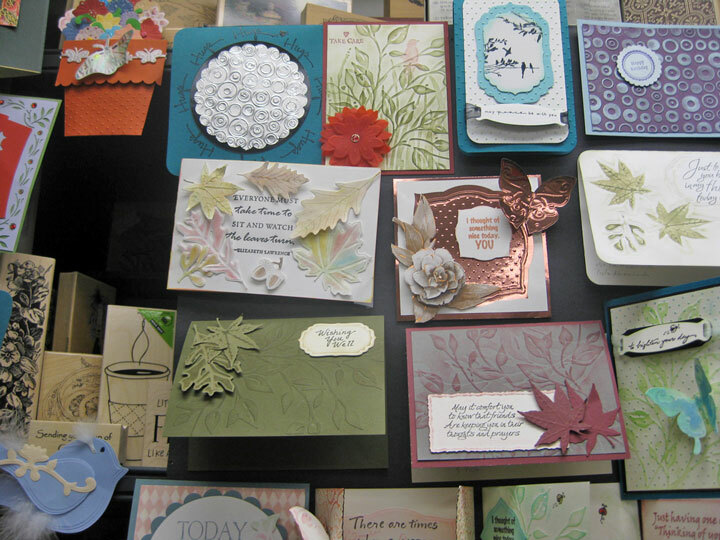 She also shared her techniques and products to emboss only a portion of a card using CB embossing folders. This makes an awesome look. 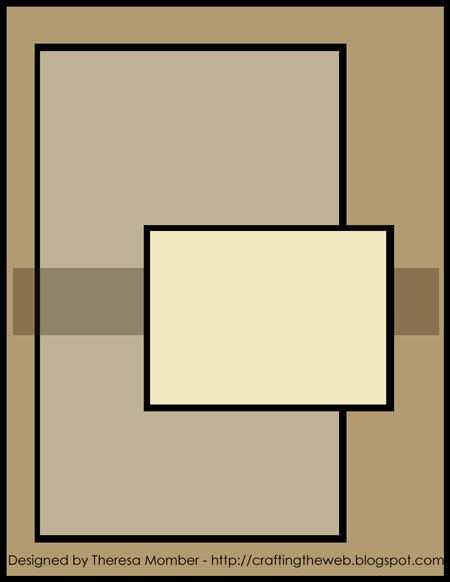 Example of her card is shown above on the right. Picture at top left shows the Stamp Pad and Owner Jane. Card pictures were taken from her website/newsletter. Of course we did some shopping...I bought a stamp, nibs, pods, markers, and more. 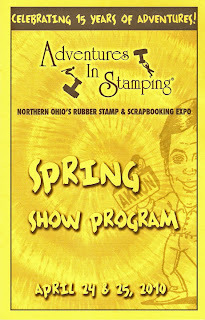 We also bought tickets to "Adventures in Stamping Convention" at Akron on April 24 and 25. We finished our excursion with a great lunch at Giorgio's ...we all had the chicken salad on croisssants that was the "bestest" I have had in a long while. Served with hot just made potato chips. I must get their chicken salad recipe! 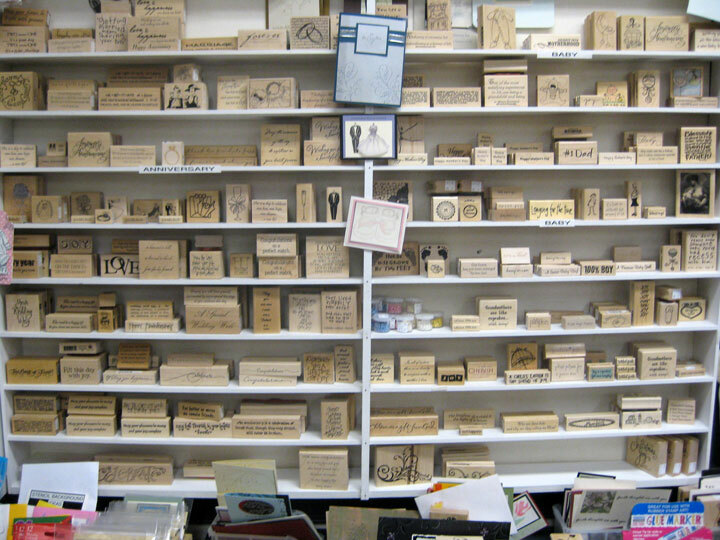 Make sure to visit the Stamp Pad if only on the web. They have a great newsletter that you might like to sign up to receive.